Indie Published Thrillers, Murder Mysteries, Whodunnits, Crime Fiction and Book Reviews. Indie Author Across Several Genres. and get a FREE book today when you do. 'The Legal and Illicit' by David Carter is an excellent read, very enjoyable...a definite thumbs-up! I recommend you check it out. Reviewed by Kim Aalaie on the AuthorsDen website. 27th January 2019. Love this author can't wait for more, just brilliant. and you can of course cancel at anytime, and I promise not to pester you too often! And here's something quite different. My children's story book "The Bunny and the Bear"
is released on November 1st 2017.
at the moment because at just 99 pence as an ebook on all formats!! business that always seems to accompany a new book launch. There will be a few more links in due course. November 30th, so please check back for that. Stay In Touch for That!! Here's a sneak Preview of the NEW COVER! Here's the book trailer for my forthcoming book, "The Inconvenient Unborn", which tells the story of two feuding families. The story is mainly located on the south coast in and around Lymington, and is set in the near future. It is due for release on March 1st 2016. Stay tuned for more information on that. England in the near future - Though you may not like what you see. 352 pages, and it will be available in paperback and as an Ebook. Giveaway ends June 11, 2015. 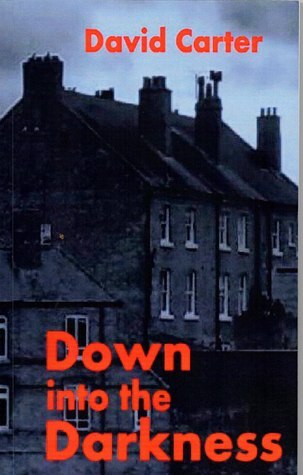 April 2015 - My book "Down into the Darkness" is out now in paperback and as an ebook on most platforms. It's a shorter book than my usual releases running to about 140 pages, but some people seem to prefer that - a short snappy read. Please take a look at the book trailer above. Here's a review posted on Amazon. I’ve read quite a few of Carter’s books now and have enjoyed them all, but I found something about the subtly and introspective nature of Down into the Darkness particularly appealing. This is a fascinating and suspenseful read which demonstrates the author's keen skill in creating and developing incredibly real and often relatable characters. From early on in this novel tension builds slowly and the feeling of mystery and that something troubling is coming is inescapable, once I had started I found it very hard to put this book down because of this. Down into the Darkness is a very enjoyable read with an original and intriguing plot and I look forward to reading more of Carter's books. You can read extracts and purchase the book here (paperback or ebook) - and don't forget you can buy an ebook copy for less than the price of a high street coffee! and if you do decide to buy, well thank you from me! It's appreciated. “Down into the Darkness” is a horror story that’s more about instilling a creeping, atmospheric chill in its reader than it is about flashy scares. The narrator’s voice in “Down into the Darkness” is strong and distinctive, with a conspiratorial tone; from the start, he freely admits to gossiping and as the reader you’re drawn in, wondering what secrets he will reveal about those he shares the house with. As the book goes on, you’re lulled a bit—it seems Tony leads a normal life and is a generally nice guy, if a bit of a loner. However, as he begins to fight against the vermin you sense something dark and malignant rising, and the suspense starts; the ending is a gory shock with a gruesome postscript to hammer it home. The humor and everyday realism mixed throughout the book—from Tony’s wry commentary to the Riches to Derek—makes the horror element all the more shocking. I would recommend “Down into the Darkness” to readers who like intelligent horror; this story leaves a lingering sense of disturbance long after the last page is turned. Inspector Walter Darriteau often goes down to the old canal in Chester, simply to think. Thank you for stopping by and I hope you will stay awhile and have a good look around. Here you will find details of my books that are published, including sizeable extracts to give you a feeling and a flavour of all my books, plus reviews as they come to hand and some backstory too, that you simply won’t find in the books. So what are my books exactly and what are they all about? The Murder Diaries Seven Times Over. The Legal and The Illicit. Oh, that reminds me, the masthead for this website was taken by the author and features part of the canal basin in Chester, down by Telford’s Quay, a scene that Walter regularly visits. If you visit Chester, and it’s a fab city to visit – there is just so much to do and see, from Roman times right up to the present, and if you go down past the Northgate Locks to the canal basin you may well see canal barges, now almost exclusively used as pleasure craft, making their way up and down hill, so to speak, – always a sight to behold. Then there’s a modern love story based on the adventures of a philandering man entitled The Life and Loves of Gringo Greene. (Gringo Greene has been a very naughty boy!!!) But much more of that later!!! Please be aware that this is intended for a more adult audience. Then there is The Fish Catcher. This is about the Fissleborough sisters and young Billy Grimes who are evacuated to Devon from London to escape the blitz during World War II, and some of their adventures are based on stories told to me by my mother who herself was an evacuee when she was moved from the Wirral out to the wilds of the Isle of Anglesey in North Wales in the early forties. Good job she went too as a German bomb fell directly onto the house next door but one, a couple of weeks later! Grist Vergette’s Curious Clock tells the story of young Johnny Vergette who is left in his grandfather’s will a strange bequest, a key. The key turns out to be for the large shed down on the allotments. Johnny Vergette goes down there more in hope than anything else, accompanied by Seri, his pretty teenage neighbour, and what they find there will change both of their lives forever. Drift and Badger and the Search for Uncle Mo tells the forest based story of Drift, a deer fawn, who is left orphaned after witnessing a terrible accident to his mother. This is a story for children and the young at heart, but please be aware that it is probably not suitable for very young children for it features some sad events too. But you will also find here on this site book reviews on other writer’s books and some news and articles on writing and publishing, along with my blog of course, that I have been promising to start writing but have always put off due to lack of time. And of course I wouldn’t be doing my job if I didn’t try and sell you something too!! Yes, really, as I am a struggling writer looking to earn some cash to pay the electricity bills – play those violins!!!! – so if you like what you see and read I’d be chuffed to bits if you bought something along the way. What is it they say? Thank you for supporting independent writers and publishers – that’s it! All of my books are available in paperback form and on Kindle too, and some of them can be bought for less than a cup of coffee, and that my friends, is great value for money – even if I do say so myself. Thanks to everyone who has bought my books, written reviews, given in to my pleading demands for proofreading duties, critiques and feedback, support, encouragement and supplying expertise where I have needed it, and as I say in all my books, ALL MISTAKES ARE MINE AND MINE ALONE, and I am sure there are plenty of those too. If you are interested you will also get to see sneak previews and news of my forthcoming books too, so why not bookmark this site and come back and check us out again in the future? Thanks for that. Or you can contact me on any matter anytime you like via the Contact Page by clicking here. It goes without saying that I always love to receive your feedback, thoughts, and ideas. In The Murder Diaries - Seven Times Over, there are not one but two suspicious deaths on the railway!